"The Devil's Trade is a one man gang chained to some burden that he pulls through his ways leaving tracks behind to lead or guide mostly him which directions not to and which to go again. The legs are old wounded up to the knees as the tracks are that deep and filled with sticks and stones but strict marks that lead him where he wants to arrive. His music is the dust he shakes during this pilgrimage of his. " " CRIPPLED BLACK PHOENIX (official) is a rock group from the United Kingdom centered around the multi-instrumentalist Justin Greaves. 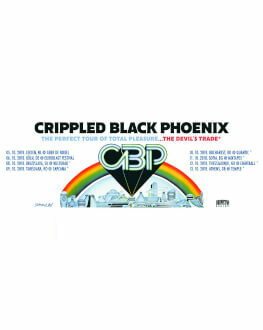 Several musicians have contributed to Crippled Black Phoenix's albums and played with them during their live shows. The band have released nine studio albums, one mini album, two EPs and a number of singles. Members of the band used to play in other bands (including Iron Monkey, Gonga , Mogwai, Electric Wizard, Hearts of Black Science ( Official ) and others). In 2004, Justin Greaves began recording primitive sounds he had had in mind for years. He was encouraged by Dominic Aitchison, and their ideas would lay the backbone for Crippled Black Phoenix. The name of the band was taken from the lyrics (by Johnny Morrow of Iron Monkey), of "Big Loader," a song on the debut album Iron Monkey. Although originally having an unorthodox start, since all the band members were part of and busy with other projects at the time of the band's founding, Crippled Black Phoenix remained committed to staying together and forged their sound. The band writes what they call "end-time ballads", signifying both the slightly macabre nature of their songs and their unusual blend of styles as the final evolution in music. This blend has led to them being called everything from stoner-prog to freak-folk to doom. Crippled Black Phoenix have made live shows a focus and have performed in unusual venues, using Victorian-era instruments in tandem with more modern instruments. From December 2014, Justin Greaves and former guitarist Karl Demata were engaged in a legal dispute over the registered trademark of the band's name.In the second half of 2015 the issue was resolved and Greaves announced a new line-up of the band that included Daniel Änghede (vocals, guitars), Mark Furnerall (keyboards), Ben Wilsker (drums), Daisy Chapman (piano/vocals) Jonas Stålhammar (lead guitar), Tom Greenway (bass) and Belinda Kordic (vocals). This sextet recorded the Oh' Ech-oes EP that included covers of the Pink Floyd songs "Echoes" and "Childhood's End".